TUMEKE! 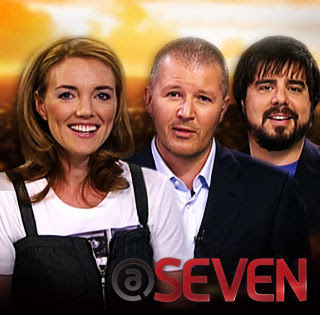 : @ Seven to replace Campbell Live? WTF? @ Seven to replace Campbell Live? WTF? The future of John Campbell's current affairs show is up in the air as TV3 refuses to guarantee that it will survive the year. Campbell was called back from holiday to a secret lunch with the newly-appointed Australian head of Mediaworks TV, Ian Audsley. Campbell and TV3's head of news, Mark Jennings were told to outline how they would improve ratings and, afterwards, the show's staff were given a rark-up. Yesterday, Audsley would give only a "95 per cent guarantee" that the show would last out the year. He did praise Campbell Live's ratings this week after the show ranked first on several occasions in its target demographic of 18-49 year-olds - on a diet of bare breasts and big American cars. "On the wins they've created this week ... the team will be enjoying a beer or three at our Christmas party," Audsley said. A TV3 source confirmed that the network had last year considered cancelling Campbell Live but the poor ratings of possible replacement @Seven had forestalled the axe. WTF? WTF? WTF? Are you kidding me? Are you putting me in a dress, applying make up, taking me out for dinner, popping a couple of roofies in my wine and trying to screw me TV3? We HAVE to urine test Audsley IMMEDIATELY for Meth - how the hell could he seriously consider replacing Campbell Live with that utter, utter, utter abortion that was @ Seven - COME ON MAN - it's obvious that the Australian hatchet man with only a 12month contract replacing staff loving Brent Impey is here with his extra $70 million to blow on promotion of the station while he guts its costs to sell off in a quick fire sale (probably to Rupert Murdoch - OR a strategic Chinese purchase) but to axe Campbell Live for @ Seven? WTF? Ummmm, okay, what the hell was @ Seven? I've never been so happy to see Campbell Live back on air in my entire life (great interview re power black outs last night btw John). It's a huge call, but screw it, I'm going to make it - @ Seven was to NZ current affairs what Melody Rules was to NZ comedy. When @ Seven started mocking those earning less than the minimum wage I thought that Paul Henry had secretly taken over as producer. @ Seven was so god damned awful it hurt, oh God did it hurt. Thank little baby Jesus it is over and TV3 can just go back to having Sunrise as its only trainwreck programme. Obviously I didn't go far enough in my denunciation of @ Seven - so let me make my thoughts a bit clearer - Petra is Christian Family Broadcasting at best, Ben's last good gig was his Comedy Central promos that unlike the recent ones were funny (seriously - the Balls Out promo is so cringe worthy and ironically for a 'comedy channel', 100% unfunny) and Paul Ego is best for radio - sure as a light weight diet infotainment meaningless summer fling to fill in while everyone is on holiday, @ Seven was the fake cream of the current affairs world, but to seriously consider replacing Campbell Live with this light weight ill thought out abortion to save costs when their other trainwreck, Sunrise, continues to hemorrhage ratings (come on Audsley, if the chop chop gotta go somewhere, surely it will be to send the Sunrise team back into the cosy world of unemployed actors?). Sure roving reporters Jacquie Brown and Dai Henwood are a delight, but they are a delight on C4, I can't imagine either one of them discussing the political machinations of national policy. @ Seven is to current affairs what Fox News is to fair and balanced. Now let's be honest, dear old Campbell Live has at times veered away from being a serious current affairs show to being a lifestyle magazine program for rich Ponsonby housewives, but to seriously consider replacing it for the moronic nonsense of @ Seven is an embarrassment for current affairs in this country, the only result being a less informed society while undermining the role of the fourth estate for a strong democracy. You gotta cut costs - fine, but sweet Jesus be smart about it all. Fox News is the mammoth profit earner that it is because almost the entire thing is talking head TV - get rid of all those costly live to air from anywhere outside broadcasts and get with the new cultural zeitgeist - there is now almost 7% of the population unemployed and a vast chunk terrified that they will be unemployed. There is a population of NZers who loved the credit card fuelled consumption culture who are now facing the crash and it's only going to get worse, trying to placate them with a vacant placebo like @ Seven ain't gonna reach those people, angry denunciation's of the hypocrisies of our time will. Will someone get Network out from the DVD store and make Audsley watch it please. PPS - Can I just note that since Matt Nippert started writing for the Herald On Sunday, the HOS has become readable for the first time since it was started. Sure I still read it first so that I can read the Sunday Star Times last so that I guarantee an intelligent thought over brunch, but it has become much more intelligent because of Nippert, well done HOS for finally employing an intelligent journalist. PPPS - That said, one of the problems surely about this entire debate is that this story is in the 'Entertainment' section of the NZ Herald on line, as if current affairs is merely an entertainment product and not a deeply necessary part of the democratic process. Seems to me there's an opportunity for the Labour Party to dream up policy that enables it to differentiate itself from all that National "change we can believe in" illusion. Ownership of media - and a look into monopolies and duopolies - that have through "vertical integrations" and other means come to the point where they can dictate to their suppliers. Small food producers (those small businesses this government professes to be so in favour of) get dictated to by the duopoly to the extent that they have a "choice": comply with the bullying OR go under! Seems to me there are two foodchains that have become "too big to fail" and are uncompetative. Media is bordering on the same. How the fook did SKY ever get approval to acquire Prime - just for starters? We've got one really weak Commerce Commission like other regulatory bodies worldwide - mostly now all being looked at for their ineffectiveness and idiotic past decisions. The ONLY reason our trading banks didn't get progressively worse in their bullying tactics was because of KiwiBank and the likes of the PSIS. What does it take for the Nats, ACT (and Labour when they're dressed inin drag) to learn a few lessons, and how long does it take? The two supermarket chains should be split into 5 or 6, SKY should dispose of Prime, Commercial Radio should be split and where there are natural monopolies they should either become publicly owned or heavily regulated. And let's not even start on those "competative" oil companies cos they're all such good corporate citizens! I can recall Campbell 2 or 3 years ago stating his concern for what could potentially happen at 3 - it seems his prophecies are being considered. Better to have a Campbell live even if it is 70-80% Paris Hilton than all Paris Hilton or nothing. Perhaps we'll get to the point soon where Freeview becomes a necessity so that the Stratos' and CUE's, 6's and 7's become a little better subscribed.